As much as I adore absolute simplicity in food — from both a preparation and a consumption standpoint — enough is enough. One does need to mix it up a bit, and try new techniques, too. 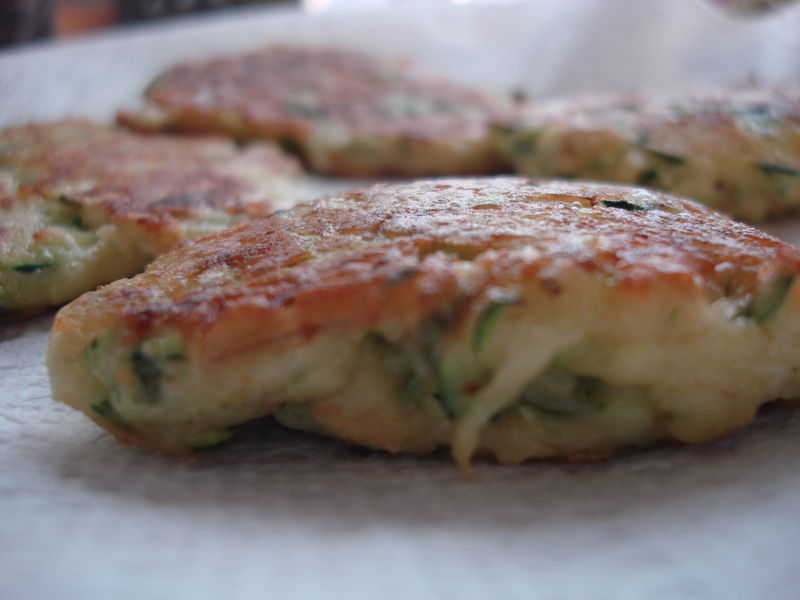 So it was time to be inspired by a recipe for zucchini fritters I saw recently at Emmy Cooks, and another one for zucchini latkes at Deborah Rivera Pittorino’s chef’s blog, Seasoned Fork (full disclosure – you will find book reviews I have written there; The Big Oyster is my favorite). Both recipes seemed simple enough, a lovely change for us over here, and as they are pan-fried, I thought I was in with a chance at getting Leandro to try veggies this way. I was wrong about Leandro, who refused outright to even smell them, but two out of three ain’t bad. This was quite simple to make and was a welcome new take on vegetables for us. I seasoned them a bit differently – using Manchego – Spanish sheep cheese -, and the herbs that complement it best: rosemary and thyme, which happily are still going strong in my containers on the stoop. I was happy that they taste good hot or at room temperature, and they came in handy, because we served them to Colombian friends who have just returned from an extended visit to their country and dropped by to say hello and bring coffee. 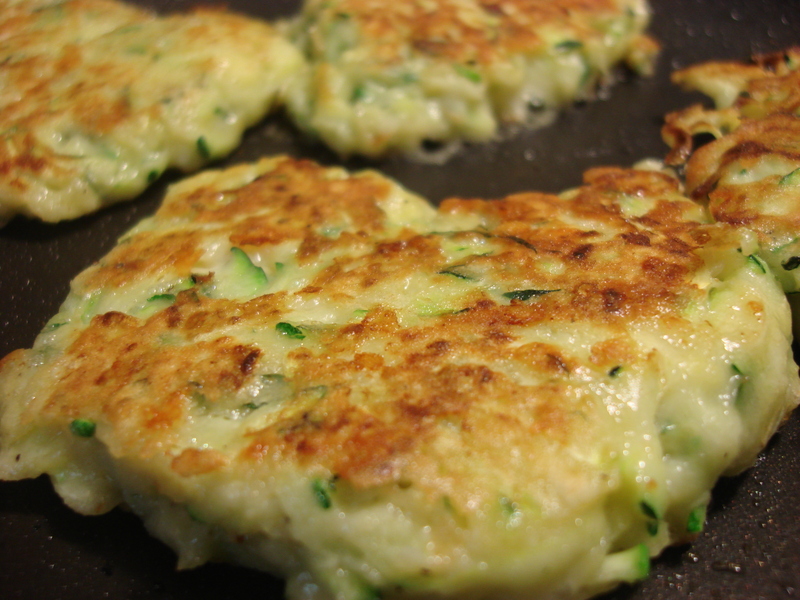 It is very easy to fry these zucchini fritters up fast. They went over very well! Heat a scant teaspoon of oil on a nonstick skillet at medium high. Set up a plate with paper towels to absorb extra oil. You will be working in batches, so using a large spoon, put dollops of batter on the skillet to make disks about 1/2-inch thick. Cook about four minutes on each side lowering heat if they seem to be browning too fast. Remove and place on paper towels. Check to make sure you have a bit of oil left in the pan (you may need to heat more), and continue until the batter is done. Serve hot or at room temperature. I do love fritters. 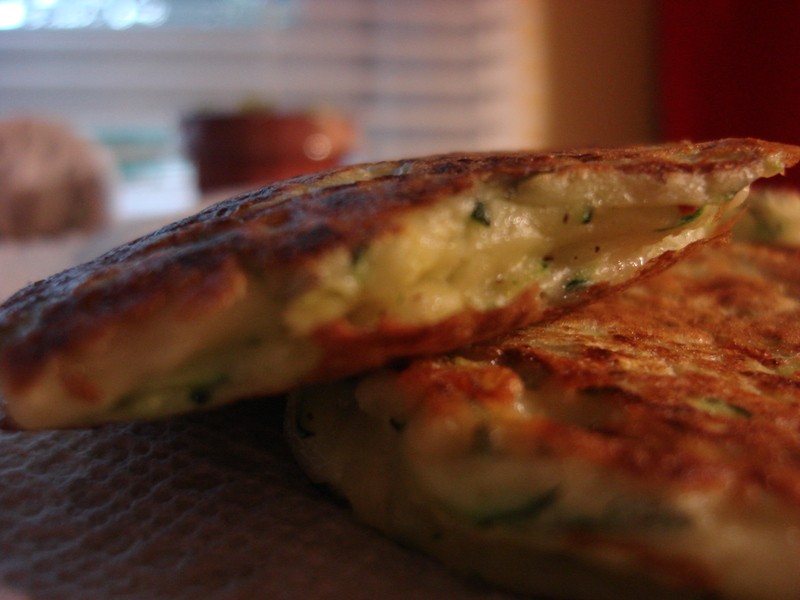 In our house we made them with bacalao (salt cod!) or rice! Thank you Cecilia! I will definitely be doing variations on this theme. 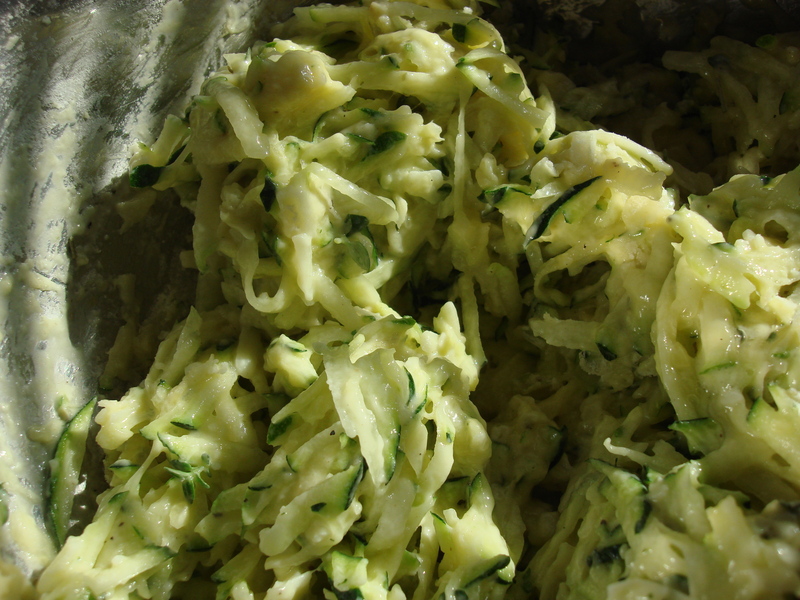 Might have to do a few with peeled zucchini…Leandro wouldn’t try it because of the green bits (which makes no sense to a grown-up who knows very well that he loves spinach, chard, kale, asparagus, and broccoli!). Zucchini is my fav veggie. These look absolutely delish. Will definitely try. Thanks for the visit…let me know if you change it up at all! Always looking for interesting new flavors…. Looks yummy…I think I’ll try making these next week. Thanks! They are delish! And lend themselves to other flavor combinations…like feta…. these are super-easy! Will be trying them with other ingredients soon! Wow, I’m definitely going to have to try these. They look AMAZING!!! thanks, Stacy! They were super-easy! Zucchini and manchego??!! I’m in love. Me too!!!! Just had the last one…yum! Thanks for the comments…it really worked well! and I am still re-heating and eating…. I love the sound of those – to die for!